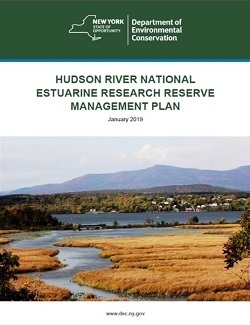 DEC has released the Hudson River National Estuarine Reserve (HRNERR) Draft Management Plan for public review and comment. The 2019 Draft Management Plan is an update of the 2009 plan and will guide the management of the Research Reserve for the next five years. The Reserve is operated as a partnership between DEC and the National Oceanic and Atmospheric Administration (NOAA) and the plan provides a necessary foundation to help manage the federally-designated and state-protected sites along 100 miles of the Estuary. NOAA designated the reserve in 1982 as part of the National Estuarine Research Reserve System, a network of 29 protected U.S. coastal areas that promote sustainability and improve coastal management through research and education about estuaries. The reserve includes four tidal wetland and upland complexes including Piermont Marsh and Iona Island, Tivoli Bays, and Stockport Flats. At the Norrie Point Environmental Center, DEC conducts management-oriented research, environmental monitoring, habitat restoration, training for decision-makers, and education. (845) 889-4745 x 118; or heather.gierloff.